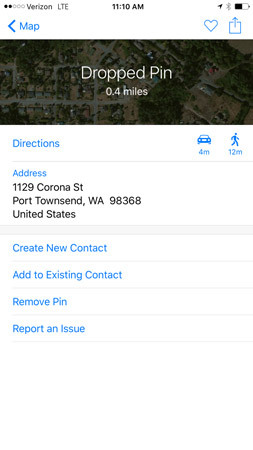 The Maps app on your iPhone is a great place to find information about a location. You display the Information dialog for locations to get directions in previous tasks. In this task, you focus on the useful information displayed there. Go to a location and tap the pin. On the information bar that appears above the pinned location, tap the arrow. In the Information dialog, tap the web address listed in the Homepage field, which you can use to go the location’s web page, if one is associated with it. 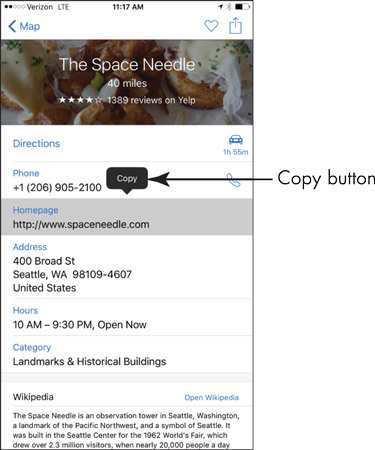 You can also press and hold either the Phone or Address field and use the Copy button to copy the phone number, for example, so that you can place it in a Notes document for future reference. Tap the Map button in the top-left corner to return to the map view. Rather than copy and paste information, you can easily save all information about a location in your Contacts address book. New to iOS 9 is the ability to share a map with the Notes app, which places the current map in a new note. Just tap the Share button and select Notes from the list of options.